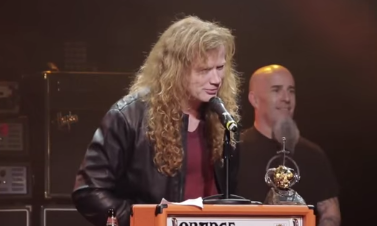 Megadeth's Dave Mustaine during his "Golden God Award" acceptance speech avoids the two former components, below some excerpts. Dave Mustaine said: "I made myself some notes today. I was talking with my management, and I have a knack for getting myself in trouble. So I made some notes of what I wasn't gonna say. I'm not gonna slag anybody. So the list is: Don't slag Metallica; don't slag the 'Rust In Peace' lineup; don't slag the two quitters; don't slag Obama. So there's not really a lot to say. But I do wanna thank… I wanna thank Universal; I wanna thank 5B, my management; I wanna thank Alex Milas and Chris Ingham from Metal Hammer. And I especially wanna thank all of you, because… People calling me golden. You guys are golden. Thank you very much. God bless you all."